Confessions of a Fashion Fanatic: Happy All Hallow's Eve! Evan & Dean on Fashion Week Daily!! Sleepyhead By Passion Pit: The Music Video! Freak, ghouls, geeks, witches, warlocks, men in fake uniform and the politically incorrect will be flooding streets tonight, armed with a costumed excuse to indulge in drunken shenanigans. Oh well. Halloween this year falls on Friday night, so TGIF to us all! My evening's attire will complement that of four or five of my other girlfriends, as the Deal or No Deal Girls. Apparently our uniform for the night consists of short black dresses, heels and silver poker cases with numbers (I bought mine for $10 off Craigslist from a very nice dude by the name of Drew). So I'm going with my trusty strapless, 80-esque dress (tight on the bottom, blouson through the middle), my Calvin Klein booties, gold hardware (never leave home without it) and some Michael Kors shimmer stick on the legs. It's an easy costume and best done in a group, which is totally fine by me. My girl C-Ra is going as Barbie-In-A-Box -- a totally rad idea, by the way -- but much too much work on a one night's-use outfit for me. I'm Lovin' it: The new umbrella I got today works SO much better than the cheap, crappy one I got from H&M that busted within two days. My hair is thanking me profusely on this rainy day right now. I'm Over it: Is it just me or do iPhones take forever to connect calls?? Well, mine does. Not good. Oh, and is it me or is the iPhone supposed to NOT let you know you've missed a call or even let it go through? Yeah. Not good. Again. 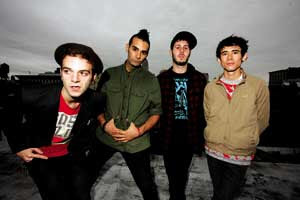 Track of the Day: "Throw Your Hands Up" by The So So Glos from Brooklyn, NY. It's definitely Brooklyn-esque indie rock type music with a few faint, catchy handclapping sections. Lots of high hat hits, too.